High school theatre teachers and educators — applications are due February 6 for NBC's R.I.S.E. America Project, an opportunity for your school's theatre program to receive $10,000. The 2018 Rural College Access and Success Summit brings together teachers, principals, superintendents, legislators, non-profit leaders and many others to share ideas and strategies for ensuring success for our rural youth. In support of the organizational goal to represent and support rural school district administrators, AASA, The School Superintendents Association, has announced a new partnership with The Rural School and Community Trust. Leveraging Change: Increasing Access to Arts Education in Rural Areas reports that promising practices and opportunities for expanding access to arts education include implementing placemaking strategies, creating collaborative rural networks, and using technology to span geographic divides. 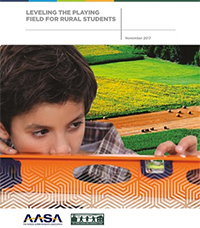 Why Rural Matters 2015-2016 is the eighth in a series of biennial reports analyzing the contexts and conditions of rural education in each of the 50 states and calling attention to the need for policymakers to address rural education issues in their respective states. On May 23, 2016, the Teacher Quality Programs Office announced the FY 16 Teacher Quality Partnership (TQP) grant competition. The TQP FY 16 grant competition has an estimated $5,000,000 and anticipates making 3-5 new awards that will increase student achievement by improving the quality of new prospective teachers. Literacy learning labs, held this summer in 21 rural schools in five states, gave students a safe space to read and write and gave teachers a chance to collaborate and try new strategies. The Coalition for Community Schools invites rural community schools to participate in the annual Community Schools Directory. The purpose of this directory is to ascertain the number, location, and scope of community schools in the United States. By participating, rural school administrators can let their voices be heard and connect with others who are facing similar challenges.